5th Grade Graduation is a big deal. All the girls were dressed to the nines. Fancy dresses and little high heels. Layered ruffles and sparkly tulle were big this year. The dress I made for Thing 2 was a sharp contrast. Simple,understated and it looked just right on her. Not that anyone noticed! Her look was completely trumped by the hair cut she had begged for in the weeks up to graduation. A sophisticated cut for a girl of 11 years. 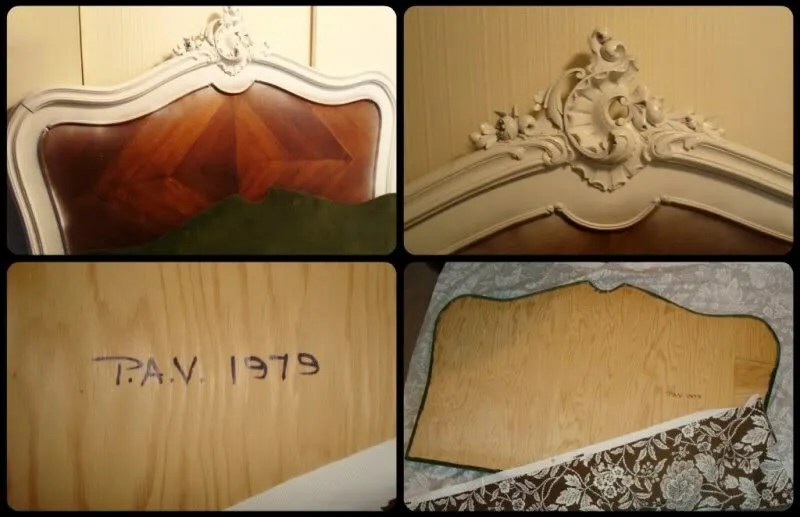 It looked darling. It changed her. Someone please tell me what happened to my baby? The happy little infant who loved getting her hair washed. The fun little tot who rocked her car seat back and forth to the music in the car. The sweet little snuggly thing that I could carry in my arms. How can this precious baby of mine walk the halls of middle school on her path to becoming an adult. Why can’t I stop time and keep her how she is? Graduation was a great day for Thing 2. She looked absolutely beautiful! A vision in white, grace and poise. She was proud of her accomplishments – perfect attendance and straight A’s. It’s a wonderful way to start summer. A welcome retreat before she begins middle school and all the challenges and changes that will bring. And as happy and proud as I am for her, I am also a little sad. I’m holding on to her last moments of childhood. I’m not letting go. 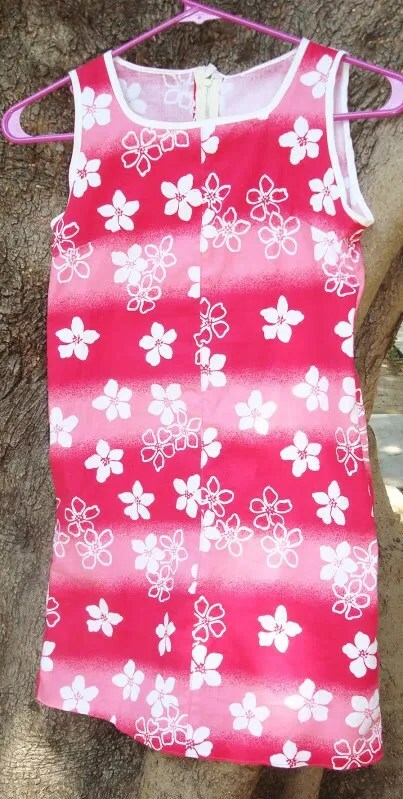 Thing 2 was busy with gymnastics and school and since she was apprehensive about the first dress design, I went ahead and finished the sun dress version in the Hawaiian print – coaxing her to try it on at various intervals so I could really customize the fit. Without being able to see the final version and having absolutely no trust in my skills and taste, Thing 2 picked out another pattern. Experience has taught me not to fight the process. After all, when you’re teaching someone to sew, you have to ensure that the project will be successful and that the end result be something she could be proud about. This time, I didn’t have Thing 2 around to help me (child of divorce and all) so I whipped up the muslin and sewed it up so she could try it on. It was a unanimous YES! The simple muslin fabric looked GORGEOUS on her! Excited with our new beginning I cut out two sets of fabrics from the pattern to got ready to sew. 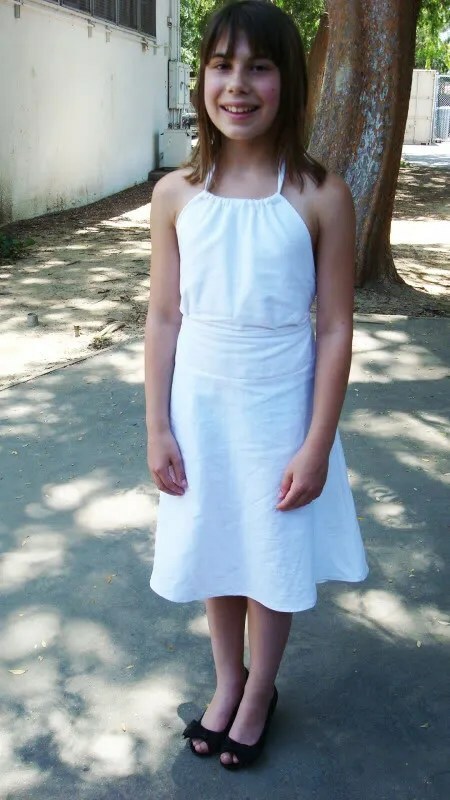 Graduation is just around the corner so Thing 2 might not get a chance to sew her own graduation dress, but at least the lesson of what you can do will be learned. Meanwhile, the original dress in the Hawaiian print was turning out darn pretty cute. The dress begged for a little more pizzazz so I edged the neck and armholes with a thin bias tape that I made from scraps of white fabric and one of my Clover Bias Tape makers. Mr. Malibu was concerned when he first saw the dress – got to give him props for noticing that the front panels don’t match. I didn’t put a lot of effort into this dress as I suspect Thing 2 won’t ever wear it. I was limited with a short amount of fabric and it was more an exercise than completing for garment that would be actually worn. She doesn’t wear dresses very often. Hopefully I’ve alleviated Mr. Malibu’s fears, because he wants a shirt made, with monogrammed cuffs, no less. A month or two ago – my trusty Husqvarna 205 and I parted ways – I’ve noticed I end my relationships pretty quickly and painlessly these days. One faltering stitch and you’re on Craigslist. I hadn’t started the Graduation Dress project yet so it was imperative that I find a replacement. Someone that I could build a quality relationship with. Don’t get the wrong idea, the 205 had been true and faithful for 15 years – I was pregnant with Thing 1 when 205 came home with me. We made the most beautiful crib bedding together for little Thing 1. From there our love grew and grew. We made many a curtain and costume and project. And the 205 never gave me any problems, never failed me. But you know… sometimes you need to move on. Sometimes you need someone who is going to give you that little extra something. The basics weren’t cutting it for me. I felt limited and stifled. I felt I deserved better. I needed to move on. Husqvarna 955e was not a new model – used – in fact, loved by another. But they too had parted ways. 955e was willing to give me more than I’d ever had before. Willing and able to do all the little things my last relationship couldn’t. And 955e is fast, faster than I’d ever sewn before. I’ve had fantasies about this but didn’t think it could really happen. You know, sometimes, in a new relationship, you’re willing to try things. Things you NEVER thought you’d do before. Sure, you heard people did that but you didn’t really expect to be doing that yourself! I’m a little embarrassed about it. But curious. I feel like it’s important to try this and make sure this new relationship is going to work. So tonight, I’m going to learn how to machine embroidery. I’m keeping an open mind and taking it slow.